New Delhi/Madhya Pradesh: As many as 592 people, including four promoters of private medical colleges in Madhya Pradesh, have been named as accused in a charge sheet filed by the CBI in connection with alleged irregularities in a Vyapam case, officials of the probe agency said. Those listed included J N Choksey, chairman of L N Medical College; S N Vijaywargiya of People’s Medical College; Ajay Goenka of Chirayu Medical College (all in Bhopal) and Suresh Singh Bhadoriya of Index Medical College, Indore, they said. While three promoters did not any comment when contacted by news agency PTI, Bhadoriya claimed neither his nor his college’s name was mentioned on the CBI charge sheet. The charge sheet was filed in a special CBI court in Bhopal in the case of Pre-Medical test (PMT) conducted by the Madhya Pradesh Professional Examination Board or Vyapam in 2012. The test was conducted for selection to various medical colleges of the state. Among those named, 334 are candidates, 155 guardians of some of these candidates, 46 invigilators during the examination, 26 officials of four private medical colleges, 22 middlemen and two officers of department of medical education, Madhya Pradesh, the officials said. The two state government officials named in the charge sheet are SC Tiwari, the then director, and N M Srivastava, the then joint director in the medical education department, they said. Of the total people named in the charge sheet, 245 have been made accused of the first time. Others have been named in the different charge sheet filed earlier by the CBI. The probe agency is looking into the various cases of massive irregularities in the various examination conducted by the Vyapam to select candidates for medical colleges and also for state government jobs. 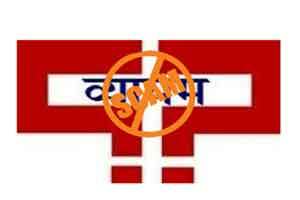 Candidature of 286 MBBS students of 2012 PMT batch was cancelled by Vyapam, while STF was handling the investigation. The agency investigating 701 candidates discovered 272 candidates to have cleared the exam in a fraudulent way. They were mapped by a technical committee on the basis of their answer sheets, sitting position and an indication of identification marks on OMR answer sheets, before being declared scammers. The CBI on its part has stood by the STF’s findings on the issue, say sources. In the case of the Chief Minister Shivraj Singh Chouhan’s, Former Personal Secretary, Premchand Prasad and his daughter for their alleged role in the manipulation of PMT 2012 case, the Bhopal District Court granted anticipatory bail. A Rs 50 lakh bond for each of them was submitted and the STF did not object to their bail plea in court. It is being alleged that Prasad’s name was found in an excel sheet document recovered from the ‘controversial’ hard disk of Nitin Mohindra, Vyapam’s Chief System Analyst. Though no allegation has been made of money having been given in Prasad’s case. O P Shukla, OSD to Former BJP minister Laxmikant Sharma’s had during questioning by the STF revealed that the minister had asked Dr Pankaj Trivedi to make sure that his daughter cleared the PMT. However, she failed to clear as Vyapam officials ticked the wrong answers on her OMR sheets. His statement copy was submitted along with the charge sheet filed by STF in the PMT 2012 examination, prior to the CBI’s 2015 takeover, reports TOI. The former minister is believed to have stated to the probe agency, that having failed to get his daughter clear the PMT, it was next to impossible for him to have succeeded in getting others clear the test. Now we live in a country where medical education system is itself destroying nation\’s health.